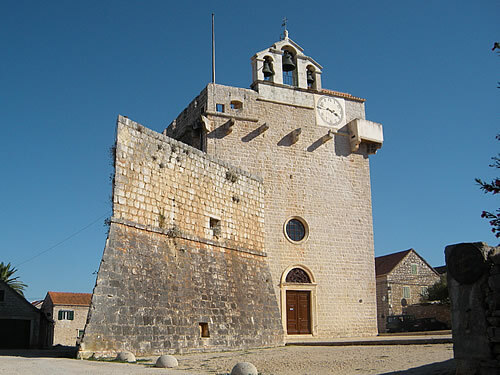 The tiny settlement of Vrboska is best known for two things – the upper harbour which looks just like a miniature canal complete with 16th century stone houses, and the somewhat unusual fortified church of Sveta Marija – or St Mary of Mercy in English. I say somewhat unusual, as there are a couple of other local churches that also have battlements, although none that share St Mary’s most distinctive feature – a pointy ravelin beside the front door. For those whose education hasn’t included elements of 16th century fortification, a ravelin is a triangular construction that juts out from the main building, to help protect the main walls. In this case, I believe the St Mary ravelin doubled as a water cistern, to supply the villagers when they took refuge in the church. In any event, it’s a fine, impressive building, and the view from the roof is beautiful. We think of St Mary’s as the clock at the end of our street. It has three bells, the smallest of which chimes the hour, day and night. It’s a nice light sound, even at night, and very helpful when you go without a watch on holiday, as I do! 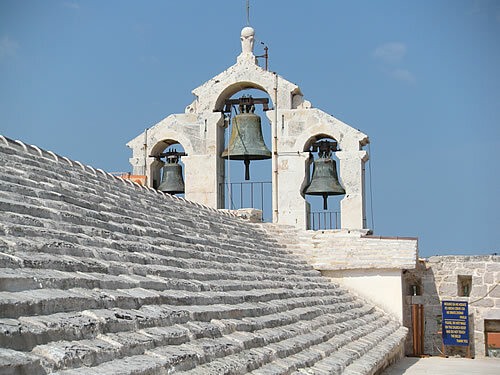 On the other hand, the bells of Sveti Lovrinac (aka St Lawrence), provide a rousing call to prayer which is clearly intended to summon the faithful from several miles away. The first time we stayed in Vrboska, we were in a lovely little stone house just next door to St Lawrence, blissfully unaware of just how early services start. So it was somewhat startling when those bells set to with a resounding clanging at 5:30am!! After a couple of mornings, of course, we easily slept through them! So it seemed to us that although St Mary’s was the larger church, and had a much bigger bell, that it was St Lawrence that made the big noise. Ah well, no, not quite. Those more familiar with the ways of the Catholic church would realize that a saint’s feast days must be duly marked by the vigorous ringing of bells. So it was last September, that we first heard ALL the bells of St Mary’s pealing in joyous celebration of the birth of the Blessed Virgin Mary. It was pretty powerful from our terrace, I can tell you, not to say deafening! That big bell resonates pretty deeply. 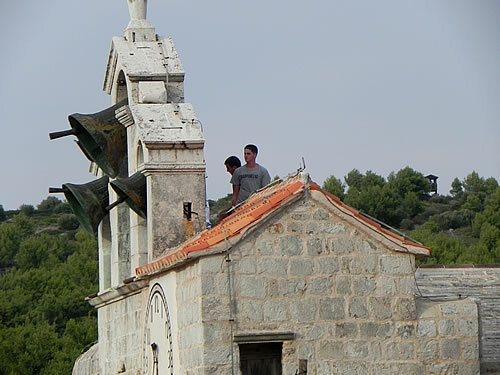 And amazing to watch – three strapping lads from the village actually climb up onto the roof and swing those bells directly. No namby-pamby bell ropes from the ground floor here! We took a video of the performance, we were so impressed with their effort. It turns out that the bells of St Marys are rung eight times a year for the feast days of the Virgin Mary, at Christmas and Easter, and twice on the occasion of a villager’s death (once on their death, once for the funeral). Now that we know, I’m looking forward to September 8th. I’ll be out on the terrace with drink in hand, ready to enjoy the performance! Many thanks to Total-Hvar for the link! I love the video you posted of the entire performance taken from the church roof itself. By the way, the caption on that video is wrong – that is definitely the bells of St Mary’s. It even says so on the big bell if you look carefully!